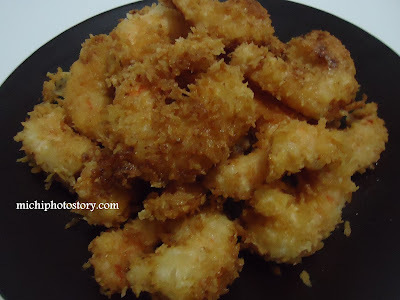 I wanted to cook shrimp tempura but looking at the procedures it makes me so lazy so I ended up cooking camaron rebosado. I don’t normally measure my ingredients so season your shrimp according to your taste. This is my version of camaron rebosado. I used the F.E.B. (Flour, Egg, and Breadcrumbs) procedure. Marinate the shrimp in lemon juice for 30 minutes. Heat a pan and pour-in the cooking oil. Combine flour, salt, pepper, cayenne pepper, and garlic powder. Beat the eggs. Put the shrimp in flour mixture, then egg and lastly breadcrumbs. Then deep-fry until the color turns to golden brown. hehe! allergic ka nga pala. sarap din kahit wala sauce. hehe!